Deciding whether to opt for a full head color, highlights, lowlights or panel blocking can be a tricky decision. That’s why a personalised consultation with a hair color specialist is always the right place to begin. By tapping in to a professional’s expertise, you can take advantage of his knowledge of colors, hair types and the latest looks for the coming season. One way in which the perfect look can be achieved is to use a combination of tones to color the hair. Doing so can add vibrancy and richness to any length of hair and, thanks to modern enzyme-based color products, will nourish the hair as part of the process. Given the complexity of three tone coloring, this is definitely not something to try at home! Instead, speak to a leading salon with a well-respected reputation for its specialist coloring services such as Sachi Studio's in Scottsdale, Arizona. Your hair colorist will be able to talk you through the color options that will best suit your skin tone and your preferred style of makeup and clothing. He will be able to help you formulate and picture the look that you wish to achieve, in terms of how and where the color is applied throughout the hair and the way in which it will be cut and styled. He will also be able to recommend the particular shades to use to achieve anything from a natural, subtle look to something bolder and more striking. Be sure to find out about the products that your colorist plans to use before the process begins. Any peroxide-based products should be avoided, as the harsh chemicals in them dry out and damage the hair. With a range of enzyme-based products on the market these days, there really isn’t a need for peroxide products any longer, so look out for brands such as Goldwell, which leave hair nourished and strengthened after coloring, rather than brittle and breakable. Once you have decided on the three tone colors to use and are comfortable with the brand, you can relax into the expert hands of your professional colorist. He will factor in your natural hair color, any previous treatments and your desired range of colors when mapping out the way in which the three tones process will be applied. For previously colored tresses, a color removal process may be appropriate before the main coloring process begins. As with the selection of the three colors that you plan to use, ensure the products used to remove any previous color from your hair are enzyme-based and nourishing. This will ensure the health of your hair in the long-term and create the perfect base for your new colors in the short-term. Once your colorist has applied the three tones and achieved the look you were after, be sure to ask his advice on appropriate care in order that your colors stay looking fresh and bright for as long as possible. Generally, it is best to avoid washing the hair for at least two days after the three tones have been applied, if at all possible. On an ongoing basis, avoiding the use of hot water when washing the hair (opt for lukewarm instead) and minimising the use of heated styling appliances will help to ensure longer-term color retention. 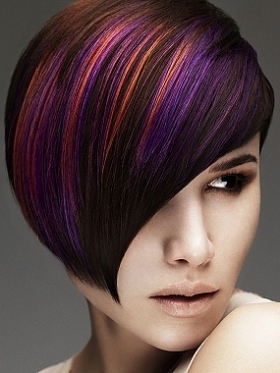 Color-fast shampoos and conditioners are also an excellent way to keep colors looking at their best for longer. A regular intensive conditioning treatment is also advisable for those looking to maintain healthy, nourished tresses. Oribe conditioners are some of the best on the market when it comes to keeping your hair in tip-top condition, so ask your professional colorist which product he would particularly recommend from the Oribe range (based on your hair length, thickness and similar factors) and then apply it regularly to ensure that your hair is pampered appropriately. By following these simple steps, you will be able to keep your three tone colors looking lush and vibrant for much longer, so that your hair looks salon-fresh every day.